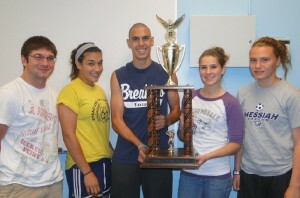 OSWEGO, NY – The Oswego High School team was the winner of the first ever U.S. Army Fitness Challenge competition held for county high schools. Members had to do two minutes of pushups and situps and run a timed two-mile course with points being awarded. Proudly displaying the trophy are team members Kyle Lamb, Jodi Kester, Ben Harrington, Kayla Sharkey and Jaime Bouffard (Dan Ellingwood was absent).